esqLABS is partnering with the Saarland University (Saarbrücken, Germany) and the Bayer AG (Leverkusen, Germany) and submitted a joint proposal on “Computational Life Sciences” with the German Ministry of Economics and Energy for the public-funding project OSMOSES to further develop the OPEN SOURCE software Open Systems Pharmacology Suite (PK-Sim® and MoBi®, www.open-systems-pharmacology.com). The overall aim of the OSMOSES project is the further development of the “Open Systems Pharmacology Suite” (OSPS), a modeling & simulation software platform, to prepare for future needs by increasing efficiency in model management and qualification. The OSPS is a robust and reliable, easy-to-use OPEN-SOURCE modeling & simulation software used in pharmaceutical and other life-sciences applications which has been qualified and accepted by a scientific community from industry, regulatory agencies and academia with hundreds of peer-reviewed publications. In 2017, Open Systems Pharmacology (OSP) made the formerly commercial software tools PK-Sim® and MoBi® (Willmann S. et al., Biosilico 2003) available as the freeware “Open Systems Pharmacology Suite” under the GPLv2 License. All source code is publicly available on GitHub. The OSPS comprises a set of individual software tools and has been designed using a modular concept to allow efficient, flexible, and transparent multi-scale systems pharmacology modeling and simulation. The software is optimized for physiologically-based pharmacokinetic (PBPK) modeling (i.e. the absorption, distribution, metabolization and excretion (ADME)) of small and large molecules in different animal species and human populations and for the integration of cellular-level systems-biology concepts (Figure 1). Over the years, there has been an ever growing demand for specialized use-scenarios in PBPK modelling (e.g. for pregnancy (Dallmann A et al., Clin Pharmacokinet. 2017, and Dallmann A. et al., CPT:PSP 2018), breast-feeding (Willmann S. et al., Clin Pharmacol Ther. 2009), and tumor-growth modeling (Eissing T. et al., Front Physiol. 2011) and for analyses of complex mechanism-based treatment effects through integration of systems-biology concepts (Schaller S. et al., CPT:PSP 2013) within large therapeutic-area- / disease-specific models (also called physiologically-based quantitative systems pharmacology (PB-QSP) platforms), which is getting more and more challenging and requires an extension, i.e. an increased flexibility of the modularity concept of the OSPS. Figure 1: Multiscale modeling and simulation. 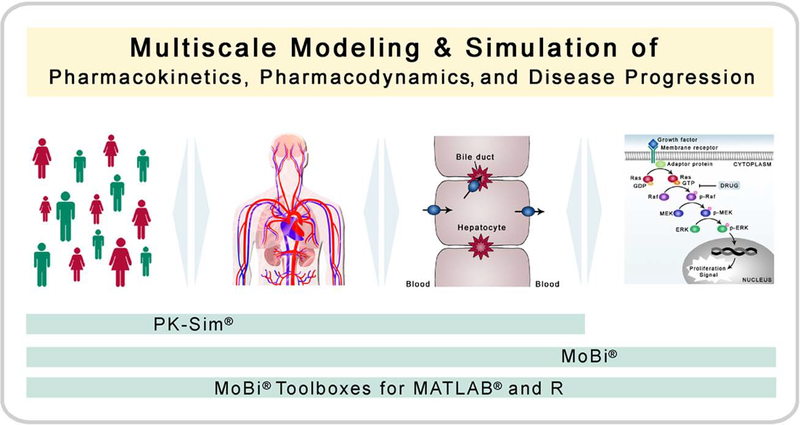 The Open Systems Pharmacology Suite software platform is designed for modeling and simulation of biological process with a focus on pharmacokinetics, pharmacodynamics, and disease progression (including biochemical reaction networks). Thereby, the platform allows the combination of multiple organizational and physiological scales. PK-Sim® has a focus on whole-body physiology and its variability in populations, whereas MoBi® has a focus on the cellular and molecular level (from Eissing T. et al., Front Physiol. 2011). At the same time the increase in complexity of models also leads to an increase in the number of possible use-scenarios. The recently issued draft guideline on PBPK modeling by the European Medicines Agency (EMA) demands the qualification of the intended use related to the PBPK platform for any type of simulation scenario (e.g. CYP3A4 inhibition, pediatric scaling (Figure 2) in primarily renally cleared drugs, etc.) in regulatory submissions. While the database and many models developed within the OSPS have been extensively validated over the years, future changes in the software platform (e.g. adjusted or extended model structure, changed parameterization of a model, etc.) require requalification of the models. 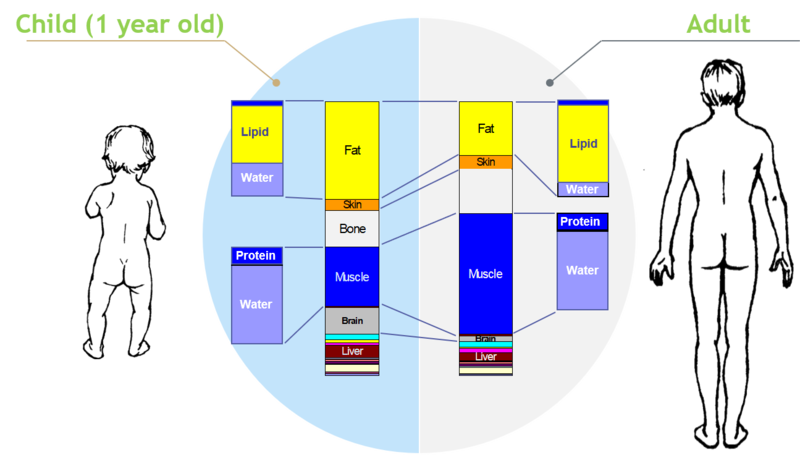 Figure 2: Graphical snapshot representation of knowledge contained in the OSPS for translational modeling and simulation in health care. Shown is the difference in organ dimensions of adults and children which can have significant influence on drug exposure and underlines the scientific value, but also the value for society when these models are applied in pharmaceutical research and development to improve drug labelling for pediatric drug therapy (graphic by courtesy of OSPS community). Model Qualification: An automated model (re-)qualification framework: The objective is to develop and implement a technical solution for automated requalification of selected (i.e. “officially released” or “OSP certified”) scenario types. This will allow convenient and quality controlled (re-)qualification of models for their intended use, which is required once changes in the software platform (e.g. adjusted or extended model structure, changed parameterization of a model, etc.) have been made e.g. for a new release. Scenario types would be a set of simulations of either PBPK or PB-QSP models to qualify: a certain drug PK, drug-drug interactions (e.g. CYP3A4 inhibition), pediatric scaling in primarily renally cleared drugs, multiple biomarkers of disease progression, etc. The specific use-cases to verify the automated requalification will be constructed from already existing and newly developed models. Model Management: Modular modeling concepts and infrastructure (“Platform Modularization”): While the software allows the implementation of any type of complex systems-biology sub-models, or “modules”, it lacks functionality to conveniently manage or change between and to share (e.g. in the OPEN SOURCE community) different modules for hypothesis testing and model extension. We want to develop a flexible modularity-based concept for efficient handling of sub-models for the implementation of comprehensive disease model platforms for the software that allows quality controlled and performance-optimized use-case specific adaptation of the PB-QSP platform. This will include an implementation of a general plugin-interface for software developers, and the functionality to organize the models into sub-modules. The plug-in interface will allow convenient extension of software functionalities, also for future developments via the open domain. Through this plug-in concept, we will also implement an interface to cloud- and high-performance computing platforms. Accordingly, we will update the existing R-Toolbox for advanced data analysis for use with the new features. As use-cases for the verification and validation of the further development we will generate a qualified open library of template PBPK models and open disease PB-QSP platforms (Schaller S. et al., CPT:PSP 2013). On the one hand, the Saarland University will generate the open library of template PBPK models by curation of existing and the development of new PBPK models. On the other hand, we will curate an existing published OPEN-SOUCE diabetes PB-QSP platform (Schaller S. et al., CPT:PSP 2013), for which esqLABS GmbH has developed additional systems-biology/pharmacology modules (i.e. sub-models) as well as species- and disease-population-specific implementations. A convenient integration of these modules would greatly improve efficiency in data analysis across different stages (from in-vitro pharmacology to preclinical and clinical research & development) and across programs (different new treatment modalities) in drug research & development. All results generated within this project, the further developed OSPS, the PBPK model library and the curated Diabetes Platform will be published freely available on the OSP GitHub homepage. The project partners believe, that this further development of the OSPS will lead to an increased adoption as the standard for complex systems modeling in the life sciences and pharmaceutical industry and thereby strengthen the world-wide user community of the OPEN SOURCE software. This will, over time, lead to subsequent further developments of the OSPS through the user community and thereby benefit not only the project partners but the whole of the systems pharmacology community equally when using the OSPS either in their day-to-day business or for their research & development (R&D) activities.